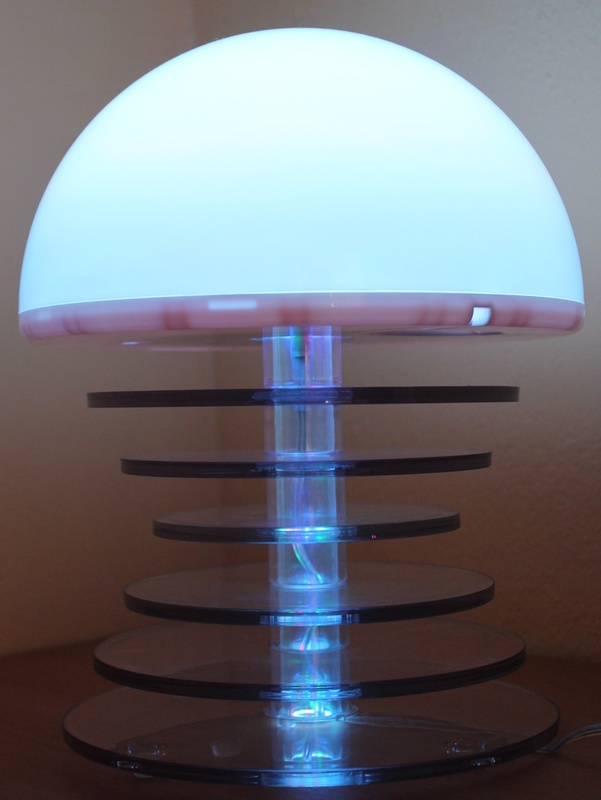 The Jellephish Mood Lamp is funky and attractive, with its array of ambient colours to satisfy every mood. The lamp comes with a smooth rubber, silky remote which can allow you to stream through the assortment of colours with a click of a button. The remote allows the selection of one of four preset modes and can also turn the mood lamp on and off. The four separate modes are 'static', 'scrolling', 'sound to light' and 'pearlescent'. The static mode allows you to choose an individual colour of your desire. The scrolling mode continually scrolls through the spectrum of colours, and you can select the speed of your choice. There are five preset speeds, ranging from 10 seconds to 16 minutes. Sound to light makes the lamp react to music, changing from colour to colour randomly according to the timing of the music, this mode is sketchy and can act very erratically and lag. Finally, the pearlescent mode produces a cool white light, with hints of red, green and blue to give a pearlescent effect. You can increase and decrease the intensity of the mode. After leaving the light on for at least two hours, the dome stayed cool and didn't overheat, which is brilliant for young children, as this is an ideal lamp to have in a child's bedroom. This lamp looks great against walls, as the vast selection and fine tuning of the transitioning bright LEDs allow the light shoot up the wall, giving a really vibrant look. 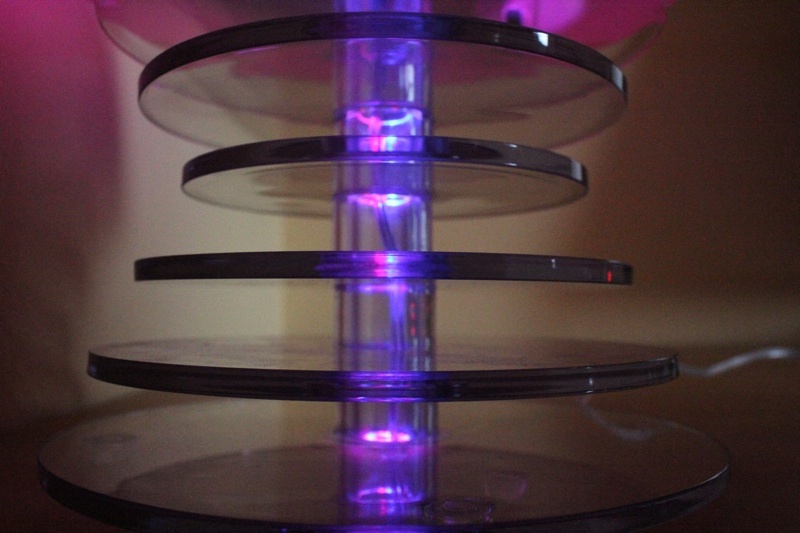 Each of the six circular perspex plates mildly accentuates the light and the middle tube where the wire travels through creates a sort of fountain jellyfish effect. The colours produced definitely feel up beat and produce a happy aura within a room. The build is very sturdy and rugged, however I did expect glass to be used to construct the circular plates, when taking into account that the RRP is £79.99 but is actually available to purchase at £53.99 on amazon. The lamp is free-standing when using its base component set, but you can also mount the dome onto a wall or ceiling. Included in the box is an acrylic/polycarbonate base component set and the Jellephish dome unit that you assemble yourself, which I found simple to do and rather fun. There is also a mains power adapter, 3 AAA batteries for the remote, and a user guide that gives you full assembly instructions and clearly shows you how to use the functions. Overall the Jellephish Mood Lamp is a stylish and fashionable light, which can be placed anywhere from the kitchen to the bedroom. There is no doubt that the beautiful array of diffuse colours change the ambient mood of the room and in so doing quickly alter your own mood. Simply press the remote and enjoy!